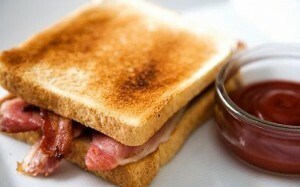 The Daily Telegraph is today reporting that bacon sandwiches cure hangovers. I’m afraid, this probably isn’t the scoop of the year for too many people. Incidentally, here’s an article I wrote for the Irish Times when pork was recalled back in December last year. It earned me a mention on What It Says In The Papers and also, fleetingly, the respect and admiration of my friends and family. My favourites are always the back and forth “studies” on tea and wine. One day it’ll save you, heal your heart and curee cancer. The next it’ll kill you, steal your car and send your wife pictures of your kidnapped children. Just don’t mix the two.